The Jew’s-Harp was at one time known as the Trump and has also been referred to as a Jaw’s-Harp. Some say that, through Jewish street traders selling them in vast quantities in past centuries, the name became corrupted to Jew’s-Trump and later to Jew’s-Harp. Little is known of its Scottish History but the earliest records seem to be of the North Berwick witch trials (1591) when one of the witches played for the others to dance to on the Sabbath and when brought to trial she was asked to play before the King of Scotland, James IV. The Jew’s-Harp was also very popular in the late 18th and 19th Centuries when travellers sometimes asked the village blacksmith to make Jew’s-Harps with an iron frame. It is mentioned in a music dictionary of 1817 where reference is made to it being the only practised instrument then known on the Isle of St Kilda. In 1975 the Traditional Music and Song Association of Scotland introduced a Jew’s-Harp competition at the Kinross Music Festival. 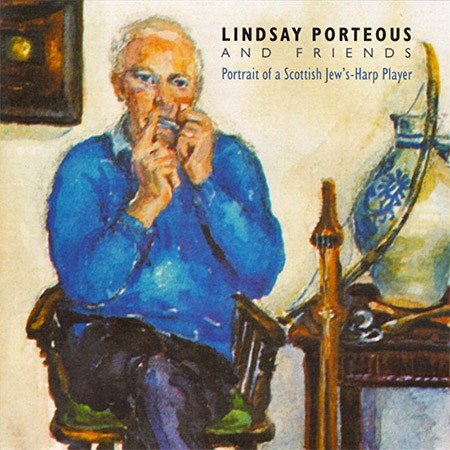 Lindsay Porteous has won the cup seven times and was later invited to judge the competition. A Jew’s-Harp competition has since been included at the Keith Traditional Music Festival which Lindsay has won and he presented a cup for a Jew’s-Harp competition at Auchtermuchty Festival. Lindsay has been playing the instrument since his father brought a Jew’s-Harp back from the 1951 Scout Jamboree in Austria and is now widely regarded as one of the best players of this and other very unusual instruments, two of which are featured on the album. The Jew’s-Harps used on the album are by the Schwartz Family of Austria, who have been manufacturing the instrument since 1679. The Mouth-Bow was the forerunner of all stringed instruments we have today and the one used on the album was made by Lindsay. The Hum-Drum was adapted from the Mouth-Bow by Lindsay, ho tunes all six strings the same, and uses the drone amplified from the mouth in the same way as the Jew’s-Harp and the Mouth-Bow.